Author: Wiebe, Rudy Set In . . . Description: A Discovery of Strangers tells of the meeting of two civilizations – the first encounter of the nomadic Dene people with Europeans – in an imaginative reconstruction of John Franklin’s first map-making expedition in 1819—21 in what is now the Northwest Territories. At the heart of the novel is a love story between twenty-two-year-old midshipman Robert Hood, the Franklin expedition’s artist, and a fifteen-year-old Yellowknife girl known to the British as Greenstockings. 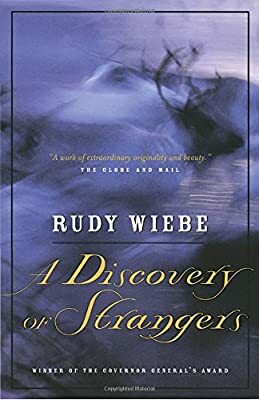 A national bestseller, published also in Germany and China, Wiebe’s first novel in eleven years and his twelfth work of fiction won him his second Governor General’s Award for Fiction at the age of sixty, over strong competition from Margaret Atwood and Alice Munro. It is a story of love, murder, greed and passion in an unforgiving Arctic landscape. French-Canadian voyageurs paddle the small British expedition into the land of the Yellowknives to search for the fabled Northwest Passage. While this trip would not prove as disastrous as Franklin’s third expedition, nevertheless more than half his men did not survive the harsh conditions. The long winter stopover allows for interchange between the cultures. When the son of a Lancashire clergyman and the daughter of a native elder fall in love, they devise a language of their own to cross their wordless divide. Hood will not survive to see the birth of his daughter, perishing in 1821 in an attempt to reach Greenstockings’s band 450 kilometres south. Nor will the Yellowknives survive much longer: within twenty years, they will be all but wiped out by a smallpox epidemic brought by the white men.